The HM Armed Forces Royal Marines Commando Sniper is a brand new HMAF figure for 2010. This deluxe HMAF figure, though retailing at a slightly higher price point, features an exciting new innovation. 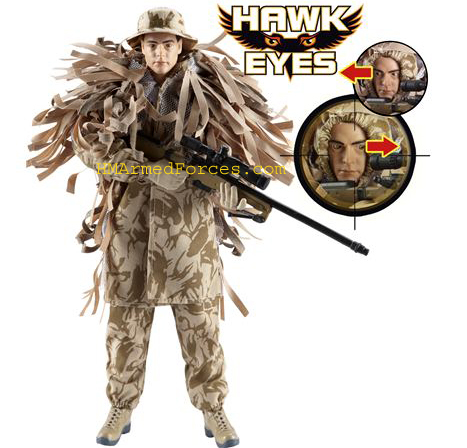 The ‘Hawk Eyes’ feature harks back to the ‘Eagle Eye’ Palitoy Action Man era with the movable eyes operated by a small lever at the back of the figure’s head. Part of the Royal Navy HMAF range, the Royal Marine Commando wears a typical desert camo snipers ‘ghille’ smock, desert combat trousers and a soft-brimmed cap which, in another very nice improvement for 2010, is removable and not moulded. The Royal Marine Sniper figure comes with the L115 A3 Sniper Rifle capable of accurately hitting its target at a range of up to 1200 metres. The ‘Hawk Eyes’ Royal Marines Commando Sniper works in a pair with an observer as part of a 4 or 6 man Sniper Troop Unit. Hawk eyes is about right because the Sniper really is the eyes and ears of the Commando Unit on the battlefield.